Philadelphia has plentiful photogenic backdrops for even the most discerning wedding day photoshoot. Elegant architecture, historical locales and secluded spots – it’s all here, right in the Birthplace of America. Try out these convenient itineraries for your photography session – each one represents the perfect way to capture your unforgettable day! Does this place have to spell it out for you? Because it certainly can – and does! 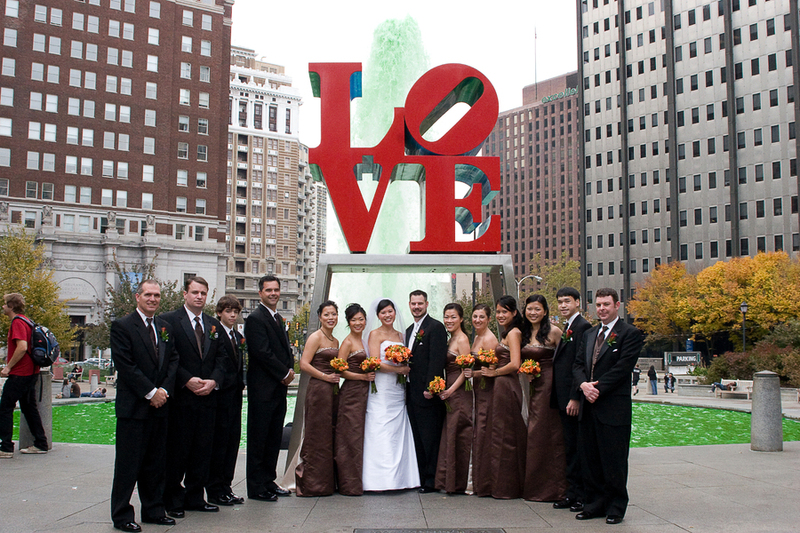 Philly’s famed LOVE Park, located in JFK Plaza near City Hall, is an iconic favorite for newlyweds across Philadelphia and beyond. Married couples routinely travel quite a distance to this landmark attraction. Your photographer will want to snap some pictures of you and your spouse in front of Robert Indiana’s LOVE sculpture. It’s a literal, modern take on a timeless theme – and the reason you’re shooting wedding photos. 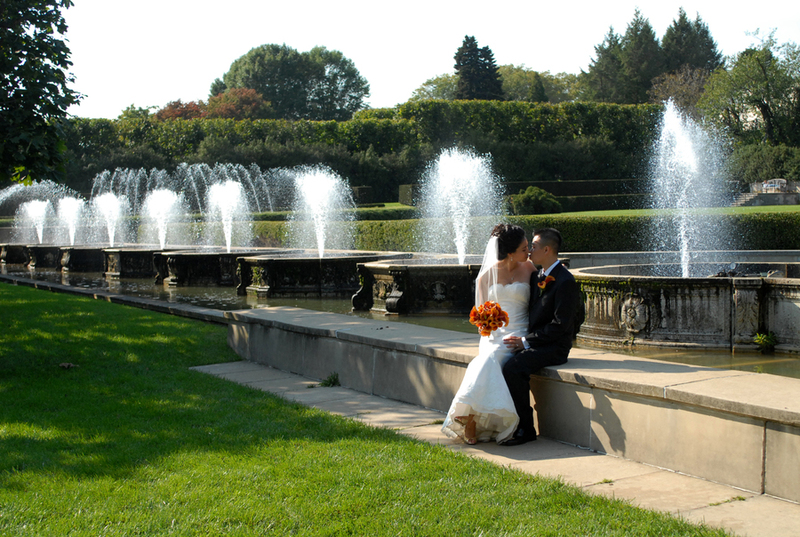 A tranquil pool and fountain are directly adjacent to the LOVE sculpture, providing a pleasant expanse to include your entire wedding party. Hard as it is to believe, this treasured Philadelphia sculpture was actually removed in 1978, two years after it was placed in JFK plaza. The public outcry was enough to get it back within the year. There are other great places for your wedding photographs near JFK Plaza. A few blocks south you’ll find the Pennsylvania Convention Center, renowned for its Victorian style Grand Hall. Call ahead to make sure it’s available; the center is a great backup plan just in case your wedding falls on a rainy day. Inside the PCC, it’s always sunny! Once a Reading Railroad terminal, it features an original wooden roof, milk-glass windows and a striking single arch design. Additional highlights include contemporary paintings and sculptures situated throughout the PCC. South of the Pennsylvania Convention Center is the Beaux Arts & Renaissance accented Wanamaker’s Department Store, the first of its kind in the City of Brotherly Love. Inside is a soaring atrium that contains one of the world’s largest pipe organs. If your wedding happens to occur in December, this is the perfect place to capture the spirited & festive Christmas atmosphere. While the crowds can be tough this time of year, it’s certainly worth including a few photographs of the building’s atrium and organ. Wanamaker’s exterior is equally noteworthy and rates as a romantic wedding photo backdrop. A few blocks south on South Broad and Locust Streets sits Philadelphia’s Academy of Music. Home of the city’s opera and ballet, it is the oldest American grand opera house still in use. Completed in 1857, it has unique Victorian Italianate style architecture and offers a romantic, cultured background for your nuptial celebration. Be sure to have your photographer include the building’s gas lamps in your pictures; they lend additional warmth & character, along with historical detail for a vintage, charming effect. The Philadelphia Art Museum features a wide staircase leading up to its European style façade. This tiered expanse has been a preferred wedding photo locale for generations. Even during crowded days, your photographer will be able to capture beautiful pictures from virtually anywhere. The museum is on the U.S. National Register of Historic Places. Established to coincide with the 1876 Centennial Exposition, it opened its doors in May 1877 and has been a Philadelphia icon ever since. Designed in Art Deco style, is has abundant Beaux-Arts detail along the upper columns and roof which provide a pleasant backdrop for your wedding photographs. Movie buffs will also appreciate the Philadelphia Museum of Art’s grand entrance – this is where Sylvester Stallone took his inspiring boxing jogs during the film Rocky. When your picture session is done at the museum, take the Benjamin Franklin Parkway towards Logan Square. Along the parkway, you’ll find Eakins Oval and Rodin Museum. Eakins Oval, named after 19th century Philadelphia artist Thomas Eakins, has decorative fountains and picturesque statues. This is a worthwhile spot for your wedding party’s photo session. Meanwhile, Rodin Museum has a relatively small exterior and classic architecture. It houses the largest collection of Rodin’s works outside of France. Finally, you’ll arrive at Logan Square – which is actually a traffic circle. The centerpiece of this photograph-worthy park is the Swann Fountain. It has three distinct statues, each representing Philadelphia’s principal waterways – the Delaware & Schuylkill Rivers, along with Wissahickon Creek. Choose multiple vantage points at Logan Square to include Philadelphia’s sweeping downtown skyline. The park offers splendid photography backdrops all year long. It’s a quiet little corner of Philadelphia that ranks #1 on some people’s lists as the city’s most idyllic landscape.